It was cloudy this morning but Leonard helped me wash and it cleared of before noon. Will & I went to town in the afternoon. The hail did make bad work in town.. Otts house was worse damaged than the home place. Will is 46 years old today. 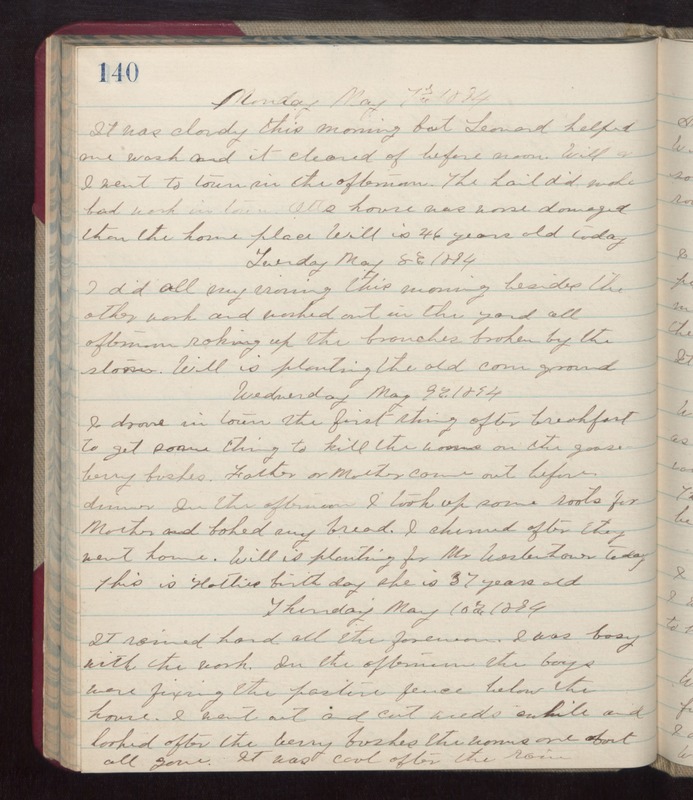 Tuesday May 8th 1894 I did all my ironed this morning besides the other work and worked out in the yard all afternoon raking up the branches broken by the storm. Will is planting the old corn ground. Wednesday May 9th 1894 I drove in town the first thing after breakfast to get some thing to kill the worms on the goose berry bushes. Father & Mother came out before dinner. In the afternoon I took up some roots for Mother and baked my bread. I churned after they went home. Will is planting for Mr Westerhower today. This is Hatties birth day, She is 37 years old. Thursday May 10th 1894 It rained hard all the forenoon. I was busy with the work. In the afternoon the boys were fixing the pasture fence below the house. I went out and cut weeds awhile and looked after the berry bushes the worms are about all gone. It was cool after the rain.